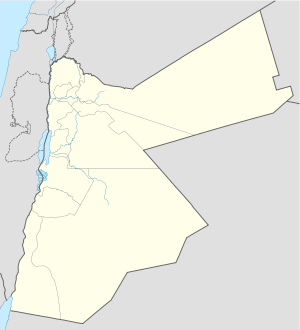 Salt (Arabic: السلط‎ As-Salt — pronoonced As-Sult or As-Sàlt) is an auncient agricultural toun an admeenistrative centre in wast-central Jordan. It is on the auld main heichway leadin frae Amman tae Jerusalem. Situatit in the Balqa hieland, aboot 790–1100 metres abuin sea level, the toun is built in the cruik o three hills, close tae the Jordan River valley. Ane o the three hills (Jebal Al Qal'a) is the site o a 13t century ruined fortress. It is the caipital o the Balqa Govrenorate. The Greater Salt Municipality haes aboot 97,000 inhabitants (2006). It is no kent when the ceety wis first inhabitit, but it is believed that it was built bi the Macedonian airmy durin the reign o Alexander the Great. The toun wis kent as Saltus in Byzantine times an wis the seat o a bishopric. At this time the toun wis considered tae be the principal settlement on the East Bank, o the Jordan River. The settlement wis malafoustert bi the Mongols an then rebuilt durin the reign o the Mamluk sultan Baybars I (1260–1277) an became a regional caipital ance mair durin the time o the Ottoman Empire. In the early 1830s, Salt wis again attackit, this time being blawn up durin a raid bi the Egyptian viceroy Ibrahim Pasha in his campaigns against the Ottomans in Palestine. Salt's heyday wis in the late 19t century when traders arrived frae Nablus tae expand their tradin netwirk eastwards ayont the River Jordan. As a result o the influx o newcomers this period saw the rapid expansion o Salt frae a simple peasant veelage intae a toun wi mony airchitecturally gentie biggins, mony built in the Nablusi style frae the attractive honey-coloured local stane. A lairge number o biggins frae this era still pit ower the day. Efter Warld War I, the toun wis the site which Herbert Samuel, Breetish heich commissioner for Palestine, chose tae make his annooncement that the Breetish favoured a Hejazi Hashimite ruled entity in the East Bank o the Palestine mandate (modren Jordan) (which wis grantit in 1921). When Prince Abdullah I rose tae pouer, As-Salt seemed tae be the ceety that wad be chosen as the caipital o the new kinrick syne maist o the industry an commerce flowed through here. Salt wis the lairgest ceety in Transjordan an haed the anerlie heich schuil. Keeng Abdullah I picked the ceety as the caipital o his emergin emirate but chynged his mind an muived his compund an entourage tae Amman when he an the notables o Salt haed a disagreement. Amman which wis a sma ceety o anerlie 20,000 fowk then ceety experienced rapid growth. Salt is famed in Jordan for its fertile soil an the quality o its fruit an vegetable hairsts, pairticularly olives, tomatoes, grapes & peaches. Indeed, it is speculatit that the toun's name providit the ruit for sultana, a certain type o raisin. It is thought that the name Salt wis derived frae the ceety Saltos o the Roman Empire. Wadi Shu'aib (Valley o Jethro) is ane o the lairgest agricultural sites in the ceety o Salt, a valley wi lairge agricultural auries. It is named efter ane o the prophets in Islam (as well as Christianity an Judaism), Shoaib (Jethro), who wis the faither-in-law o Moses an ane o the descendants o Ibrahim (Aubraham). Maist privately awned ferms are locatit in this valley; the primary crops are grapes, olives an fruit-bearin trees. An auncient toun, Salt wis ance the maist important settlement in the aurie atween the Jordan Valley an the eastren desert. Acause o its history as an important tradin link atween the eastren desert an the wast, it wis a significant place for the region’s mony rulers. The Romans, Byzantines an Mameluks aw contributit tae the growth o the toun but it wis at the end o the 19t an the beginnin o the 20t century, durin Ottoman rule, when Salt enjoyed its maist prosperous period. It was at that time that the Ottomans established a regional admeenistrative base in Salt an encouraged settlement frae ither pairts o their empire. As the toun’s status increased, mony merchants arrived an, wi their newly acquired walth, built the fine hooses that can still be admired in Salt the day. These splendid yellae sandstane biggins incorporate a variety o local an European styles. Typically, they hae domed ruifs, interior courtyards an characteristic heich, airched windaes. Perhaps the maist bonnie is the Abu Jaber mansion, built atween 1892 an 1906, which haes frescoed ceilins, paintit bi Italian airtists, an is reputit tae be the finest example o a 19t century merchant hoose in the region. Tichtly built on a cluster o three hills, Salt haes several ither places o interest, includin Roman tombs on the ootskirts o toun an the Citadel an site o the toun’s early 13t century Ayyubid fortress which wis built bi al- Ma’azzam Isa, the nephew o Saladine suin efter 1198 AD. There is an' a' a sma museum an a handicraft schuil whaur you can admire the traditional skills o ceramics, weavin, silk-screen printin an dyein. Salt’s Archaeological & Folklore Museum displays airtifacts datin back tae the Chalcolithic period tae the Islamic era as well as ither items relatin tae the history o the aurie. In the folklore museum there is a guid presentation o Bedouin an traditional costumes an iveryday folkloric items. Wikimedia Commons haes media relatit tae As-Salt.